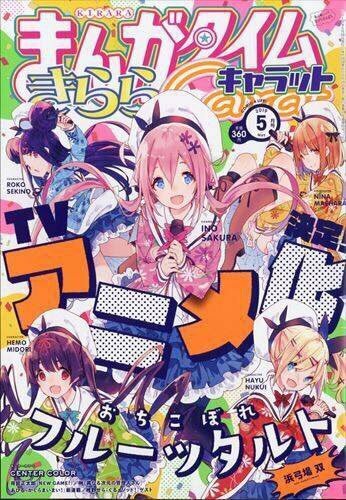 Manga 'Ochikobore Fruit Tart' is getting a TV anime adaptation. Fourth dormitory of the Rat Production (commonly known as Nezumi-sou), the place were dropout idol girls live; the former child actor Sekino Roko, musician Nukui Hayu, and model Maehara Nina. Sakura Ino, who always dreamed of becoming an idol, moves in. At the same time the decision is made to demolish the dormitory. Due to the project launched by the manager Kajino Hoho, “Ochikobore Fruit Tart,” occupants of the dormitory form a new idol group called “Fruit Tart,” and start their activities in order to repay a one hundred million yen debt. Last edited by Stark700; 2019-03-26 at 11:46. Paying a debt? Looks interesting. Will try first 2 eps.